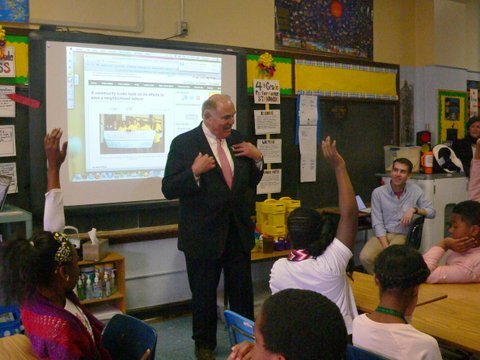 With your help The Rendell Center can continue our mission to educate and inspire the next generation of citizens. Take a look at the meaningful work we have done this past year. Read our Year in Review letter. The Rendell Center is a registered 501(c)3 corporation with a Federal Tax ID of 47-1905724. The Rendell Center graciously accepts donations of securities, such as stocks or mutual funds. Donating appreciated securities is a way for you to give to The Rendell Center while recognizing numerous tax benefits yourself. Making a gift that is larger in value than the original cost to you. Example: You purchased 100 shares of ABC Corp. in 2010 for $10,000. By 2017, the value of your 100 shares of ABC Corp. has appreciated to $15,000. If you contribute these 100 shares to The Rendell Center, you are able to claim a charitable contribution on your income tax return in the amount of $15,000, even though the stock only cost you $10,000 at the time of purchase. Receiving an income tax deduction for the full market value of the gift. Example: In 2017, you contributed 100 shares of ABC Corp. to The Rendell Center, which you purchased in 2010. The value of these shares at the time of your contribution was $15,000. You itemize your deductions on your 2017 federal income tax return and claim a $15,000 charitable income tax deduction. Assuming that you fall in the 28 percent federal income tax bracket, your charitable contribution of appreciated securities saves you $4,200 of federal income tax ($15,000 x 28%). You may also realize state tax savings. Example: In the example above, you contributed 100 shares of ABC Corp. to the Rendell Center, which was valued at $15,000 at the time of contribution and was purchased in 2010 for $10,000. Assume that, in lieu of making a donation of the stock, you sold the stock for $15,000 and contributed the cash to The Rendell Center. Upon sale of your shares of ABC Corp., you would recognize a gain of $5,000 ($15,000 value – $10,000 cost). This gain would cost you federal and state income taxes of roughly $750 and $250, respectively (assuming a federal capital gains tax rate of 15% and a state rate of 5%). By contributing stock instead of cash from the sale of stock, you avoid this tax on the capital gain. DISCLAIMER: The Rendell Center does not provide tax or accounting advice. This website has been prepared for informational purposes only. You should consult your own tax advisor before engaging in any transaction. Securities can be gifted to The Rendell Center via electronic transfer. It is necessary for you to contact your broker to initiate the transfer. You or your broker should contact The Rendell Center at beth.specker@rendellcenter.org in order to obtain the information necessary to donate the securities. By making a tax deductible donation to the Rendell Center through the EITC program, not only do you receive a reduction in your tax liability, but your company is helping us to educate the next generation on the knowledge, skills and dispositions of responsible citizenship. Businesses making an EIO donation may be eligible to receive a tax credit of 75% for a one year commitment or 90% for a two year commitment. Eligible companies may take up to $750,000 in tax credits per fiscal year. Guidelines are available at the DCED website. Sign up and start giving today! When you sign up through the AmazonSmile program, and whenever you shop on AmazonSmile, Amazon will donate 0.5% of the price of your eligible AmazonSmile purchases to Rendell Center For Civics And Civic Engagement. It’s a great way to help support the work we do! In accordance with IRS regulations, no goods or services have been provided in consideration of this contribution. We are funded solely through private donations. Thank you for supporting The Rendell Center for Civics and Civic Engagement!